Are you struggling with Math or Science? Maybe English isn't your strongest subject? Any SPHS student who has a grade of "C" or lower in an academic class may get the personal help they need to succeed. SPHS Parent's Club is offering a Peer Tutoring Program where students in need can receive help from a peer tutor in the subject(s) they are struggling with. This program is entirely funded and operated by the Parent's Club. Do you really excel in specific classes and are interested in earning community service hours or extra money? Peer tutors must have a grade of "B+" or better in the subject area and parental permission to tutor. 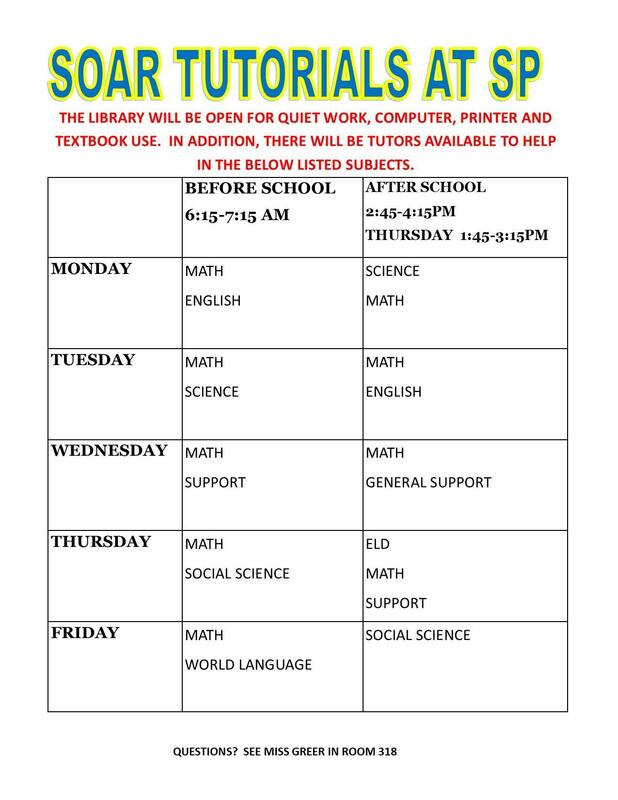 Tutors are paid $7/hour ($10/hour for 2 students), or you can earn community service hours. Application forms for both the tutors and students who need help can be picked up at any time in the Library.